American Independence Day brought us a few thoughts of home. (Way to go Tyler Farrar in helping us cheer for Americans today!) Now that we have been “on our own” for a while, without depending on George Pohl at the ICC, we feel more like explorers, and less like clients. 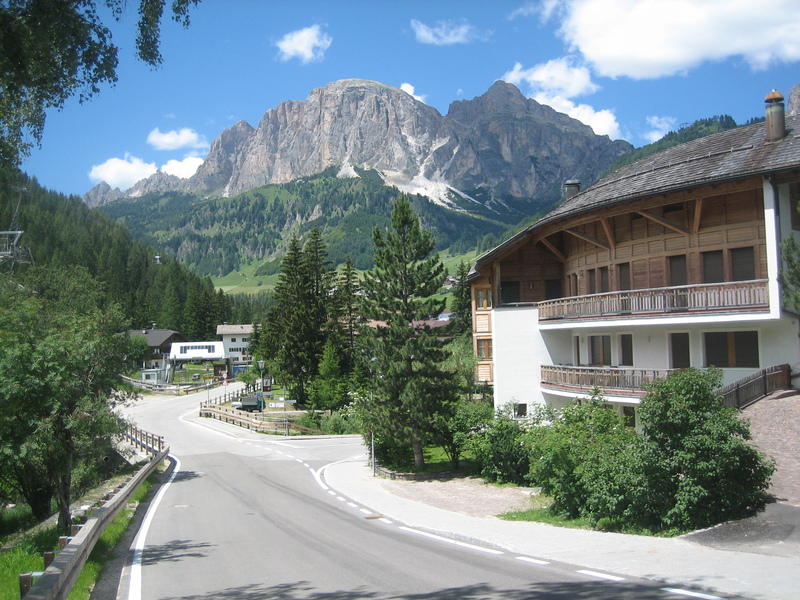 Today’s agenda has us busing from Bolzano, to Plan Gardena, then transferring buses to Corvara. The cab that arrived to transport us (really, our baggage, as it is only a few hundred meters) at the hotel in Bolzano had room only for two bike boxes, two roller bags, one daypack, and one tourist. So Ben walked to the bus station while Sherie rode in the cab along with our luggage. After a short wait, we loaded the baggage below the seating, boarded the bus, and rolled along. Not crowded at first, the bus stayed off the autostrada (toll highway) and made local stops. Once we turned up Val Gardena, quadruped hikers (everyone seems to poke the ground with two trekking poles as they walk, even on the sidewalk) with daypacks kept boarding until it was standing room only. Families with kids, old folks with lapdogs, and young adults with high-tech clothes mostly left the bus at Wolkenstein, where Sherie and I had ridden the gondola up the mountainside five years ago. One stop more and we were in a parking lot in Plan, luggage on the pavement, awaiting the transfer bus. In the Dolomites, any flat ground is man made. Everything slopes, often steeply, up to the spires that tower above. 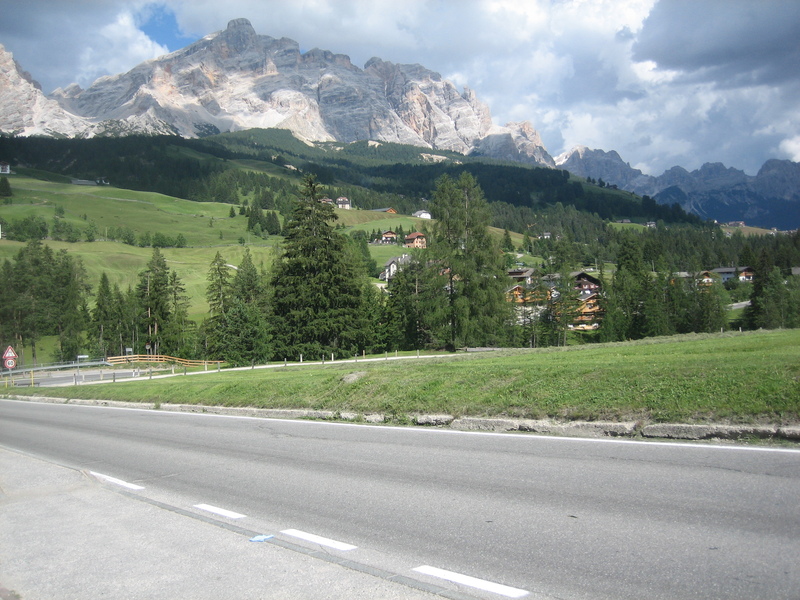 On the ride to Corvara, the bus travels over Passo Gardena, switchbacking up and then down as the mountain sights delight in all directions. Buses, trucks, cars, motorcycles, and bicycles all share the road passing when safe and holding behind the slower users when not. The roadside typically is meadow, often with cows grazing, between the various ski lifts that reach upward towards the spires. When the talus gets too steep, or the vertical rock begins, the lifts end near the various huts that serve wondrous food and drink to the mountain traveler. Cafes and tourist shops line the road below. 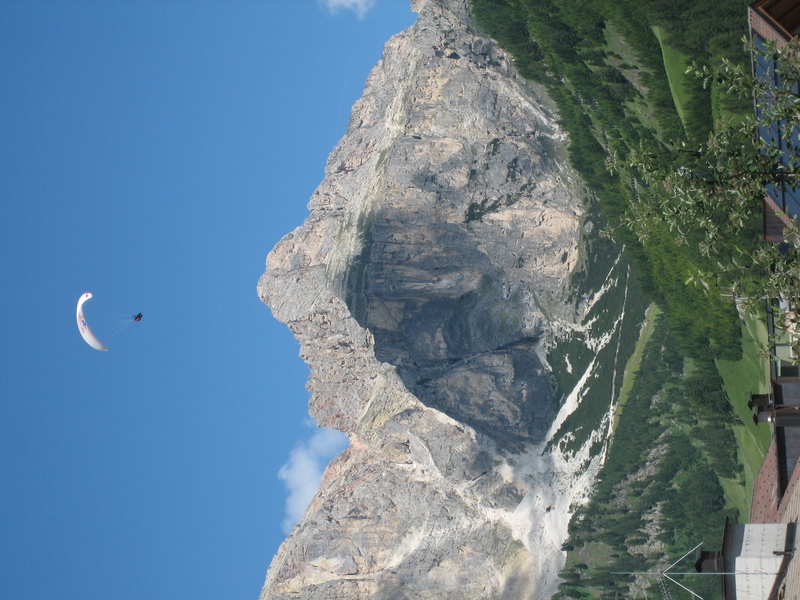 As we arrived in Corvara (elevation 1500 meters), hang gliders and parapette riders circled above while tourists moved about on the streets and trails below. We telephoned the hotel, and they gladly picked us up for the ride across town. Again, Sherie traveled with the luggage first while Ben waited for a second trip. Our hotel, Albergo Pradat, is so nice; a bit quieter than some as it is a few blocks from the main roads with their constant traffic (can you say motorcycle parade?). The views of the Sella are spectacular from just about any window. Our young hostess (and her sister?) seem to speak at least German, Italian, Ladin, and English, making us feel welcome. After we settled into the room, strolled around town, and had a sandwich at a cafe, we used the garage to assemble the bikes. Our short ride to test the bikes and flex our muscles helped us remember that there is no flat riding around here; it is either up or down. 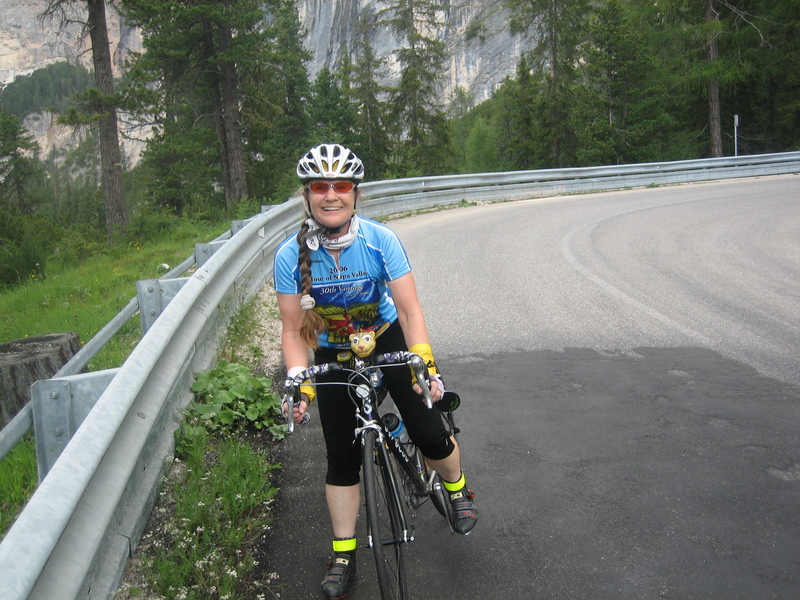 The views are spectacular, and we were relieved to note that yes, we do have the ability to ride these mountain roads. A nice dinner with some local wine refreshed us. A very nice couple at the neighboring table had been speaking Italian. Finally the man spoke in English to ask us where we were from. So a conversation ensued about their Maratona experiences (his ninth, her seventh) and plans for the week. An older man spoke to them in Italian; apparently he is some age group top finisher who needs to go to blood doping control very early on the morning of the Maratona. As I write this the next morning, the day shows signs of last night’s rain showers. Current skies are broken, lots of clouds hiding the peaks of the Sella. We will see what the agenda brings today.